Spread dumping recycled concrete rock. Recycled Asphalt Over Recycled Concrete Rock- A great combination that will level out and stabilize quickly. Recycled Concrete Rock - $16.95 per ton. 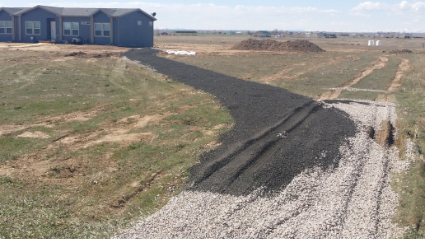 Recycled Concrete Rock has many use's both as driveway bottom course, the entire driveway material, as well as retaining wall and drainage line applications. You should check your local ordinance's for the rules on acceptable materials in your area. 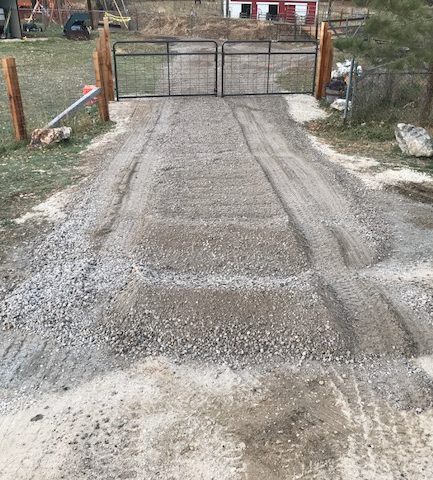 Driveways - Because there is a small amount of concrete on the rock, it seems to somehow interlock when spread on very sandy or clay soil driveways. It will stabilize almost any surface. 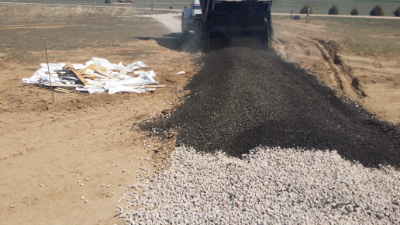 Most customers then have us spread dump recycled asphalt or concrete over it. Some customers just use the recyled concrete rock as the entire driveway material. Retaining walls and drainage applications - 1"-1/2" recycled concrete rock can be a less expensive option than gravel, because it is approximately 50% the price of gravel and in most low water flow/pressure residential situations it will work just as well. Check with your city/county for allowable materials and uses. 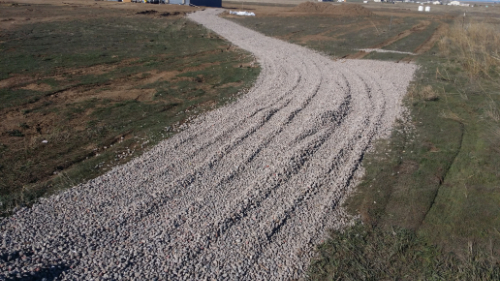 Recycled Concrete Rock- The material has been spread dumped and is now ready for grading. This method eliminates much of the work of spreading out the material. Asphaltic roadbsase over recycled concrete - The combination forms an interlocking base that tends to stay in one place and last years. 30 feet by 40 feet = 1200 square feet. 1 ton of recycled concrete rock covers 80 square feet 2 layers deep. 1200 divided by 80 = 15. You will need 15 tons of recycled concrete to cover this area approximately 2 inches deep.